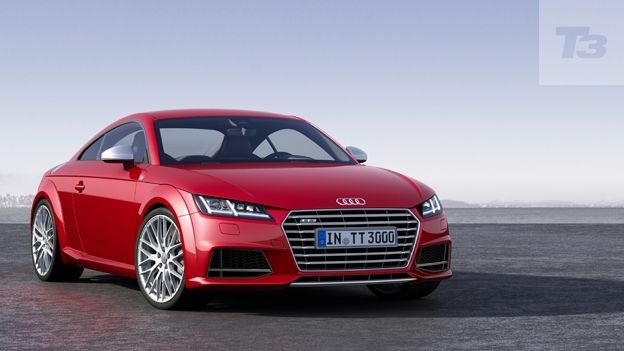 Audi has unveiled the new Audi TT and Audi TTS at the Geneva Motor Show 2014. Both cars feature a revolutionary new virtual cockpit which moves the entire media system behind the wheel. The car is a radical departure from previous models taking clear inspiration from Audi's recent concept cars and the Audi R8 with sharper lines and a more muscular profile. Where things get really interesting however is inside the car: Audi has fitted the Audi TT with an all-new virtual cockpit which moves the entire media and navigation system behind the wheel in the form of a large digital dashboard. The display can show anything from the sat nav, media information or in-depth car settings letting you adjust the lighting profile of the Audi TT's optional Matrix LED headlights. The speedo and rev counter will change in size depending on three modes, 'Classic' mode gives the rev counter and speedometer equal presence on the screen, 'Infotainment' minimises the dials whilst for those that buy the Audi TTS you'll get a third 'Sport' mode which lets the dials dominate the display. The system can be controlled either via a new wheel-mounted control panel or the traditional MMI interface down below the gear stick. Audi has retained the iconic 'turbine' air conditioning vents but brought them into the digital age by placing the controls actually in the middle of the vents themselves. Engines are equally as high-tech with the Audi TT launching with a 2.0-litre TDI that develops an impressive 380nm of torque and will send the car from 0-62mph in just 7.2 seconds. Of course if speed is your only goal then the Audi TTS will feature a 2.0-litre TFSI that produces 310bhp and will sprint the car from 0-62mph in a lightning fast 4.7 seconds. There's no word yet on when the Audi TT and Audi TTS will launch yet, or indeed how much they'll cost but as soon as we know we'll update this story.